Hanoi, June 15th, 2018 - The Exhibition of World Press Photo Contest will officially return to Vietnam after 15 years of absence. This event honors winning photos from more than 73,000 works in the 61st World Press Photo Contest which is organized and sponsored by Canon and the Dutch Postcode Loterij. The exhibition opens from 16/6 to 6/7/2018 at the Vietnam University of Fine Arts (42 Yet Kieu St., Hanoi). 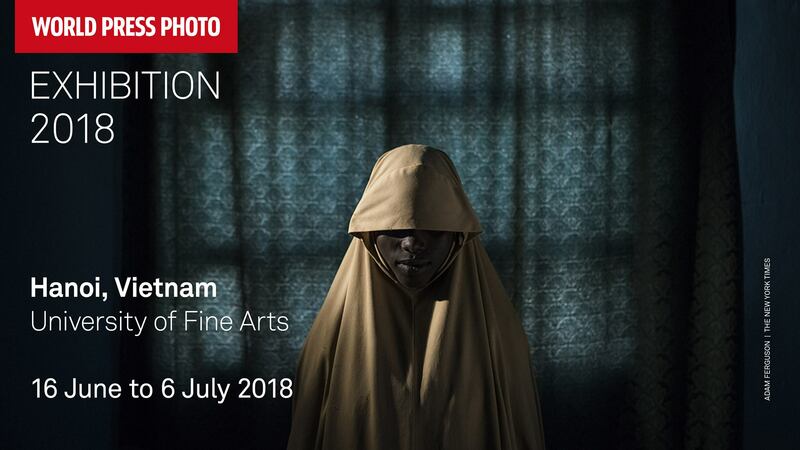 The Exhibition of World Press Photo Contest is one of the most prestigious photo exhibitions in the world and displays the best journalistic photographic works by authors from all over the world who take part the contest every year. Displayed photos make the viewer stop to feel, think and from that, they decide to take action. This year, along with big cities in Asia such as Singapore, Tokyo, Kyoto and Macau, the exhibition will also be held in Vietnam to mark a return after 15 years. The event is in line with other activities to celebrate the 45th anniversary of Vietnam-Netherlands friendship, organized by the Dutch Embassy and Consulate. Ms. Nienke Trooster, Ambassador of the Netherlands in Vietnam, stressed: “The celebration of diplomatic relations between the two countries is not just about to looking back, but also to opening up new opportunities, expanding relations and to tightening of solidarity as well. Along with the improvement in trade and investment relations, information exchange of people in two countries is also important. I believe that 45 years is just the beginning of a lasting relationship, not just between the governments but the people of the two countries". This year, the exhibition includes 130 works of various topics (contemporary issues, environment, news, nature, people, sports, etc.). The award-winning authors and works of World Press Photo Contest, which are well-known in Vietnam, including the picture of Phan Thi Kim Phuc (also known as "Napalm Baby") taken by photographer Nick Ut (1972), the picture of Son Doong Cave taken by Carsten Peter - a German photographer (2010), or the "The Pink Choice" album depicting lives of Vietnam’s gay couples by Maika Elan (2013). The winners of the 2018 World Press Photo Contest were announced in Amsterdam last April with the highest prize of Venezuelan photographer Ronaldo Schemidt with a masterpiece that made audiences unable to control their feelings. Founded in 1955 in Amsterdam, World Press Photo Contest connects professional photojournalists around the world via visual stories. It now has become the most trustworthy photo contest in the world, got patronized by Prince Constantijn of The Netherlands, supported by the Dutch Postcode Loterij and is sponsored worldwide by Canon. At the end of January of each year, thousands of photos from around the world are sent to Amsterdam and World Press Photo Foundation for a chance to be one of the winning photos. The top criteria for choosing the winners are information of photos and the fearless spirit to capture those moments.